It's the item you'll use more than any other you own, but you don't have to spend a small fortune to ensure you're getting the most value for your buck. If you're in the market for a mattress you should take your time, shop around, and compare prices and features to ensure you can get a great night's sleep without breaking the bank. CityNews Consumer Specialist Jee-Yun Lee, student Amanda Buckstein, and expectant mom Theresa Seto set out to discover if you need to spend big money to be comfortable. The trio tested three types of beds: a $1,000 pocket coil springs mattress and foundation set; a memory foam piece that doesn't require a boxspring selling for $2,200; and a luxuriant $5,000 foam and latex sleeping spot. All three agreed the $5,000 option provided the best snooze satisfaction. "I can't afford it, but it's definitely comfortable and luxurious," Buckstein said. But if you don't have that much money to drop on a mattress, the trio agreed that the $1,000 option provided good comfort and the best bang for your buck. "It just felt really comfortable," Seto said. "Firm enough but not too firm." Gary Baskerville of the Better Sleep Council Canada reiterated that you don't have to spend a lot to get good value - and a good night's sleep. But you do need to be a conscientious shopper. "You really need to look at about 30 mattresses to really get a good scope," he advised. "A good quality mattress will have a comfort life of approximately eight years." If you do choose a mattress but realize it's not right for you after a few nights of sleep on it, there's no need to fret. Many retailers offer a comfort guarantee, which means you can exchange it for something else after you've tried it at home for a few days. 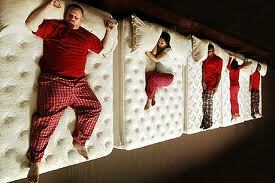 For tips on buying a mattress, visit the Better Sleep Council Canada website. Innerspring:The most widely purchased type of bedding uses the support of tempered steel coils in a variety of configurations. Layers of upholstery provide insulation and cushioning between your body and the spring unit. The result of this basic approach, coupled with state-of-the-art technology, is a full range of comfort choices. Foam: Solid foam mattresses also offer a wide choice of "feels." They can be made of a solid core or of several layers of different types of foam laminated together. Advanced technology in polyurethane foams, refinements to traditional latex and the new visco-elastic ("memory") foams have added to the choice of comfort, support and performance. Airbeds: Airbeds are now designed to look like the familiar mattress/boxspring combination, with an air-filled core providing the support instead of an innerspring unit or foam core. These designs also offer a range of feels and typically are adjustable to suit individual sleeper's needs. Futons: Futons are a popular alternative for those who need a sofa by day and a mattress by night. The mattresses must be very flexible, so they are typically made of cotton, synthetic fibers and foam in various combinations. The futon is designed to support sitting as well as sleeping. Adjustable Beds: Electrically adjustable beds allow sleepers to adjust the head and foot of the bed to the most comfortable position. The mattress and foundation must be specially built for the flexing motion and can be innerspring, foam or a combination. Since the flexing causes extra wear on the mattress, quality construction is very important. Mattresses not built for this purpose should not be used with an adjustable bed frame. Waterbeds: Most waterbeds are now designed to look like the familiar mattress/foundation, with a water-filled core providing support coupled with layers of upholstery for insulation and surface comfort. Quality construction is especially critical when water is involved, so look for assurance that the vinyl and seaming are designed for maximum durability. The Matching Foundation: A good foundation (boxspring) is as important as a good mattress. 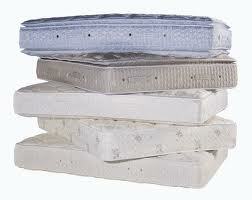 The foundation takes a lot of the nightly wear and tear and contributes to the bed's overall comfort and support. Never put a new mattress on an old foundation. When you select your new mattress, buy its companion foundation - the two are designed to work best together. In fact, buying the mattress without its matching foundation may affect the terms of the warranty. Comparison shopping can be tricky when it comes to mattresses as you probably won't find the same model in different stores as many companies choose to carry exclusive lines. Find a sleep set you like and then see what levels of comfort and support you can get for the same amount of money in another store. Ask the salesperson if they can show you illustrated or actual "cutaways" of the interior of the different mattress and foundation choices so you can see what's inside. Compare store services such as delivery, financing and removal of old bedding as well. Shop for the best value, not the lowest price. You'll use your new mattress more than any other item you own so you'll want to take it for a "test drive" before you make a final decision. Take your shoes off and lie down in various positions on the mattress, paying extra attention to the support it provides your lower back and the comfort level at the shoulders and hips. You should take your partner along with you when you shop. Proper installation. Make sure your new mattress and foundation are properly installed in your home. Improper installation can damage your new sleep set. If you choose to transport and install on your own, ask the store personnel to give you some tips to help you avoid problems. Rotate it. Unless your mattress care instructions indicate otherwise, you may want to periodically rotate your mattress from end-to-end and from top-to-bottom. Use a protective pad. A good quality, washable mattress pad (and one for the foundation, too, if you like) is a must to keep your set fresh and free from stains. Let it breathe. If you detect a slight "new product" odor, leave the mattress and foundation uncovered and well ventilated for a few hours. A breath of fresh air should do the trick! Give it good support. Be sure to use a sturdy, high quality bed frame. If it's a queen or king size set, make sure your frame has the strong center support that will prevent bowing or breakage. Don't dry clean. The chemicals in dry cleaning agents/spot removers may be harmful to the fabric or underlying materials. Vacuuming is the only recommended cleaning method. But if you're determined to tackle a stain, use mild soap with cold water and apply lightly. Do not ever soak a mattress or foundation. Don't remove the tag. Contrary to popular belief, it's not illegal to remove the law tag, but the information on the label will serve as a means of identification should you have a warranty claim. It's not a trampoline. Don't let the kids jump on your sleep set. Their rough-housing could do damage to the interior construction, as well as to themselves! No boards, please. Never put a board between the mattress and foundation. It may enhance the sense of support for a while, but it will only make the problem worse over time. When any bed in your home has reached the "board stage," get rid of it. Follow manufacturer's instructions. Again, be sure to follow any specific guidelines from your manufacturer to best care for your sleep set. Out with the old. Now that you've treated yourself to a new sleep set, arrange to have your old bed removed and disposed of. Don't give it to the kids, relatives, guests or neighbors. If it wasn't good enough for you, it isn't good enough for anyone else. Throw it out!